Villa Carolyna is a beautiful villa with four levels, and four large bedroom suites with adjoining baths and patios all on separate levels. There is an additional optional 5th bedroom/caretaker's suite available which is ideal for children. The villa is equipped with an elevator and ramp access to the master bedroom suite and the main dining and community pool, sunbathing, and entertainment areas. Wind your way to the heights of Orofino in Chacala, Riviera Nayarit. Here you will enjoy breathtaking views and panoramic vistas as well as the seclusion of your private and majestic villa with its gated entrance and luxurious setting. The villa is within minutes of the fishing village of Chacala with its gentle sand beach and several beach side restaurants. You will be thrilled to have all of the luxuries of the modern world. Your four-bedroom suite villa comes equipped with a maid, full kitchen and beautiful furnishings. The huge rooms open to terraces and share the spectacular views of the bay and the lush tropical setting. The large bedrooms have adjoining open-air bathrooms, each compete for the world's most gorgeous view. Three bedrooms have one king size bed, and the fourth has two twin size beds,plus two extras in the same bedroom, The den also has a pullout twin size bed. Retired business executive and three daughters and five grandchildren living in Evergreen, Cherry Hills Village, and Denver, Colorado. Chacala retains the charm of true Mexican culture, while still enjoying a spectacular, modern villa. Wonderful local community with Mexican, American and Canadian residents. Great certified beach perfect for children, and several wonderful beach side restaurants. Convenient, nonstop air service to nearby Puerto Vallarta. VERY SAFE, AND RELAXING! Spectacular and quiet, tropical setting overlooking the Pacific Ocean and the quaint fishing village of Chacala. Great view of Playa Chacala from the Villa. Mexican town, eat Mexican food, and hear Spanish spoken. The beach was crowded, as it was during the holidays, but I loved watching Mexican intergenerational families enjoying the beach. The beach was kept clean, even with all of the beach goers. We truly enjoyed our stay. Thank you. Villa Carolyna was just beautiful in every aspect. Very warm and accommodating and also decorated to suit all. the staff was very accommodating and pleasant. Cannot wait to come back and will tell my friends about it. Jerry, the owner is the best and added greatly to our entire experience. Simply the best place we ever stayed! Between the house, the views, the scenery, the sunsets, the grounds, the pool, the privacy, the birds, the food, the flora (not to mention the incredibly skilled people who care for the villa and its guests), this is an absolutely wonderful place to relax and read and think and even work in isolation. Our group of seven has already decided (to quote Schwarzenegger), WE'LL BE BACK. We just spent a week on a family reunion at villa Carolyn's. 7 adults in 4 bedrooms. It was the perfect way to be together but give each couple or person space. Hard to imagine getting tired of looking out at the sea, floating in the pool, with birds soaring and the bay below. But if so there is hiking, a lovely beach, boating, and maybe more we did not discover. Maggie, the lovely and capable housekeeper, discreetly made sure we had everything we needed. We had meals delivered from local restaurants--including the best snapper anyone had ever had. No one in our party was the least bit ill, thanks to purified water throughout house. Quiet and beautiful. We will be back!! This place is perfect for anyone who wants to relax. The village is small and peaceful so you can stay at the beautiful house all day or take the jeep to the beach/town. I also enjoyed walking to and from the beach and around the property. The staff were very helpful and polite, and had great English! I would recommend this to anyone, families, girl's trips, family vacations etc. Can't wait to go back! Four Seasons Resort Quality with the privacy and VIEW that is unbelieveable! 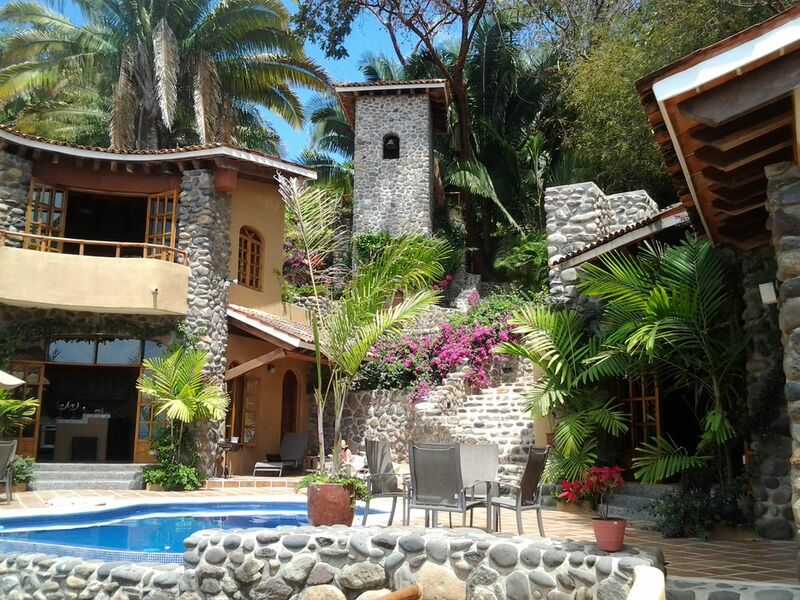 We started our vacation in Sayulita for a family reunion and stayed in a very big/ nice house there. We had a few extra days and decided to check out Chacala for the surfing. This place is amazing and so much better than Sayulita's house!!! We have stayed in VBRO/ Airbnb's all over the world-- and this may be the nicest one yet. Immaculately clean and well cared for, views that don't stop, tons of space and all around wonderful living. We were a single family, but it could easily host 2 families. Filipe and Maggie take amazing care of the place (and make sure that Maggie cooks for you-- Maggie's cooking and the spectacular view from the dining room, really can't be beat.) It is a hike to the beach-- 15 mins down, 20 mins up or 8 min drive to town-- which means that you need to plan your trips to the beach but the villa is so nice, we ended up staying there much more so than we normally would. Living room is spectacular-- great place to read, play games or have drinks. We didn't eat in town but preferred to cook at villa-- much nicer. Surfing was great-- rented a panga at the marina-- and my husband and boys surfed for 2-3 hours every morning at a good left break with only 3-4 other surfers. Ideal location for relaxing family/ business/ book club/ bible study/ yoga getaways.